Junk and Rubbish Removal Services in Delaware. 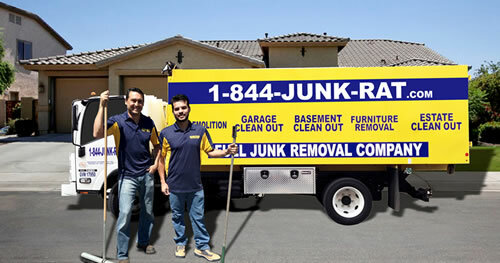 At 1844-Junk-Rat – junk and rubbish removal in Delaware is made easy… because we do all of the work! If you are trying to remove clutter from your home, cleaning up your office or getting ready to relocate, 1844-Junk-Rat.com is here to serve the needs of Delaware. We do all the heavy lifting by getting rid of the mountains of junk or even single heavy items if needed. When you call our office to set up an appointment, you will be given a quote for your project that includes all disposal fees so you aren’t blindsided by additional cost. Being eco-minded, we handle any donation and recycling that needs to be done. We take care to load, haul and dispose of every last bit of junk you have to make your project run efficiently. The only work you have to do is waving goodbye to the piles of junk that are claiming your space! We serve both commercial and residential clients at an affordable rate that’s well below the industry standard. If you are want professional service at a price you can afford, 1844-Junk-Rat.com is the company for you. If you are trying to remove clutter from your home, cleaning up your office or getting ready to relocate, 1844-Junk-Rat.com is here to serve the needs of Delaware. We do all the heavy lifting by getting rid of the mountains of junk or even single heavy items if needed. When you call our office to set up an appointment, you will be given a quote for your project that includes all disposal fees so you aren’t blindsided by additional cost. Being eco-minded, we handle any donation and recycling that needs to be done. We take care to load, haul and dispose of every last bit of junk you have to make your project run efficiently. The only work you have to do is waving goodbye to the piles of junk that are claiming your space! We serve both commercial and residential clients at an affordable rate that’s well below the industry standard. If you are want professional service at a price you can afford, 1844-Junk-Rat.com is the company for you. I had some nice items in my home that I no longer needed but didn’t have space for. I didn’t want to send them to the dump or deal with trying to sell them online so I thought about donation. Not knowing much about it I gave up and called a junk service. They told me that there are donation services available but they didn’t offer them. They referred me to 1-844-JUNK-RAT.com which is the best thing that ever happened. They are great when it comes to answering questions and taking care of donation and recycling of things that can’t be used. 1-844-JUNK-RAT.com was able to get me in their pick up schedule the next day and arrived on time which is a lot when you have a million other things on your plate. When they came out, they were able to get everything loaded and tagged in very little time all while maintaining a professional demeanor. They even swept the area afterwards which I didn’t expect. Totally worth the affordable fees they charge.